Gen Xtinct: Who Are the DeBolts, and Where Did They Get 19 Kids? 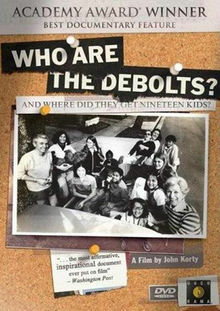 Who Are the DeBolts, and Where Did They Get 19 Kids? Before there were the Duggars and the Gosselins and Octomom, there were the DeBolts. Dorothy DeBolt and her first husband had five kids of their own and had adopted two when he died of cancer. She adopted two more from Vietnam as the war was just ending there. She remarried, to Jim DeBolt, and in addition to his own daughter, they adopted 10 more. Many of their kids had disabilities, and they were from all over the world. When this documentary aired in 1977, I was 10. I had three cousins who'd been adopted from Korea, but I surely didn't know any family as large and rollicking and brave as this one. The DeBolts became my heroes. I kind of forgot about them until recently, but their Web site is informative and fun. Dorothy and Bob are still hale and hearty (as is one of their parents, at 100). Their kids, aged 34 to 54, have spread out, and they give a listing of their names, ages and families. All of them are living independently and supporting themselves, and there are now 29 grandkids and one great-grandchild. A happy ending to a story I really loved in the 1970s.